Second day of hanging man.... this is now a case where selling is happening but bulls are still managing to take markets up. If long, SL would be around 6640 spot. Swing trade reversal level is 6400. Incidentally VIX was up by 16% today. This has the effect of making options expensive. Option writing points to support at 6400... till option writers start writing calls, assume the trend is up. We had a short trade on break of 6750F (first arrow, horizontal line). This got stopped out on close above 6725 F (second arrow, horizontal line). Trade generated around 20 points profit. These are some new breakouts happening ... I will post charts later on. Markets were initially rangebound between 6690 and 6720F. By one o'clock, it was clear that chances of it breaking day's low was slim. On daily charts, markets closed near the highs and also the week's highs... this is a bullish sign. On the other hand, there is probable hanging man (bearish). Trend is up with support at 6400. Some small signs appearing of resistance at higher levels. Also, after a long time, I am seeing call writing at higher levels (6700) implying this level may not be crossed in APRIL... this is tentative though and may change. Put writing support exists at 6500. There were 3 buy signals as shown by arrows.... the first buy signal was around 6630F while trailing SL got hit at 6655F levels. 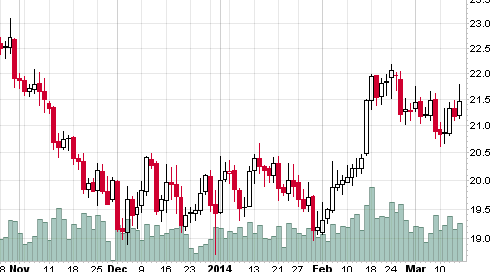 Note how markets are slowly getting rangebound at higher levels and signs of selling are coming in. Trend is up with support at 6400 levels. APRIL series option writing clues point to support at 6500 and resistance at 6700 levels. We had a buy signal as shown in the first box... trailing stoploss got hit thereafter and trade was closed at break even. Trend remains up with reversal level at 6420. We seem to have stiff resistance at 6600 levels. Weekly close above 6600 will be strongly bullish. Today was an extremely rangebound day with a trading range of barely 20-30 points. Very difficult to do anything if one is using 5 min charts. Tomorrow look at action below 6580F or above 6615F. NIFTY makes and closes at a new high. The rally was led by bank stocks and index heavyweights. Advance decline was negative which means that inspite of markets closing at a new high, most stocks actually closed in the red. BANK NIFTY gains 2.6%.... this is how the charts look like. A 30-40 point move in first 15 minutes is a strong move and sets the bias for the day. Crossover above 6580F was the first buy signal. NIFTY continues to trade in a range... most probably we are seeing formation of a diametric (diamond shaped). If true, we are towards the end stage of this and markets should give a break out of this range. A very tight rangebound day with markets trading between 6510 and 6530F... nothing to do on a day like this. A good selloff which kept getting resisted at every minor level. Most probably this will lead to a more rangebound trading or formation of a diametric followed by a breakout/ breakdown. Today was a confusing day as markets kept breaking day's high/ lows only to reverse. 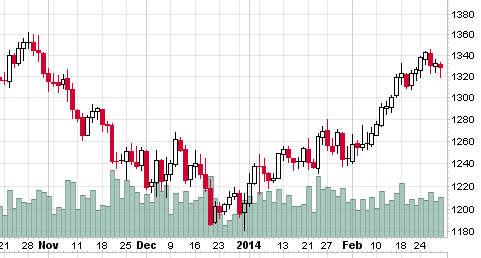 Fortunately the reversals were kinda warned of in candlesticks. Trend is up with support at 6400 levels... breakout level is 6570 spot corresponding to roughly 22000 on sensex. Initial bias was weak as the first 5 min bar opened gapup but closed near the low. 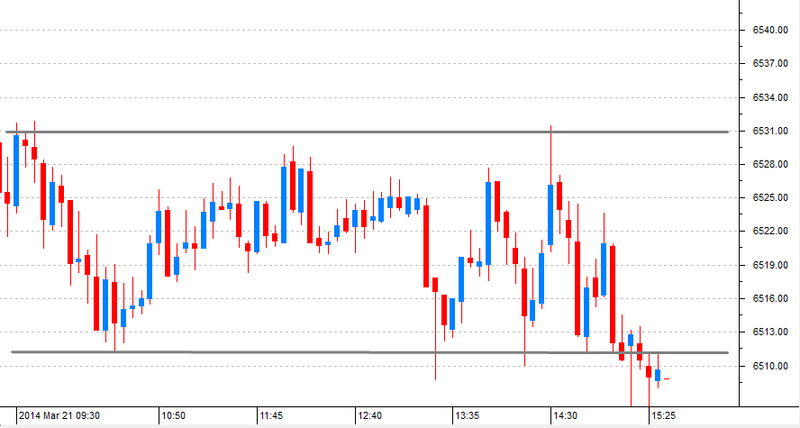 We now have evidence of selling and therefore resistance at 6560 levels. 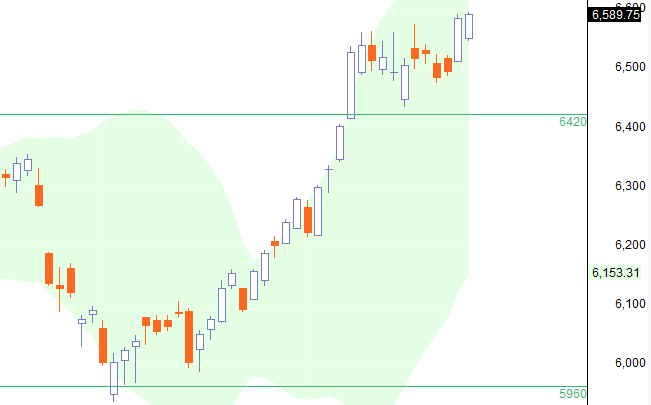 In futures, this level corresponds to 6600. Of course, part of the reason is the psychological resistance perceived at sensex (22000). Initial bias was bullish though it was a difficult to take a long position as markets in recent past were unable to cross 6600. GOLD trend is up with support below 1350 levels. It will now enter a cluster of strong resistances at 1400-1450. NIFTY closed above 6500... close was near weekly open. Support at 6400 is still holding though going by option data, we are seeing a cut in 6400 put and some increase in 6600 call levels. Initial bias was bearish... the bullish close of the first bar did not lead to any further buying and the candlestick patterns in the first box set the stage for a short trade. Despite initial bias being bullish, markets close at day's low... now uptrend is in doubt and will be confirmed if recent supports break. First signal was a buy around 10.25 when markets formed a big bar and closed above day's high (first arrow). Withing the range of the breakout candle, we are witnessing sideways trading such that range formed in last 2 days was still holding today. 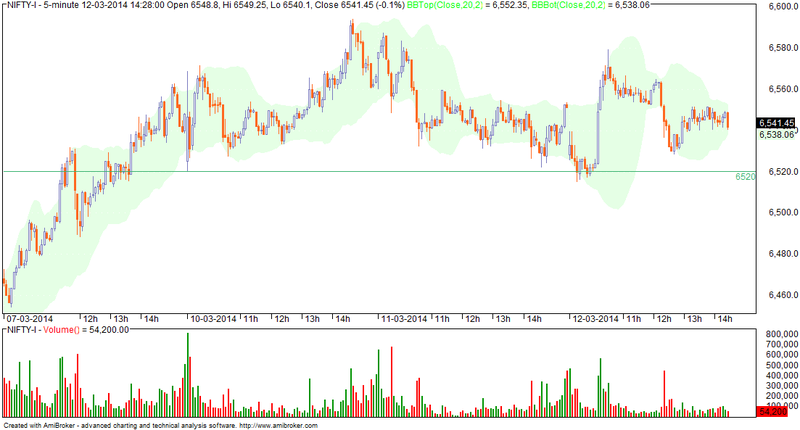 This level is 6480 spot and so expect profit booking below 6480 spot. Initial bias was down... however as mentioned in this post, correction would start only on break of 6520F. Expect a correction only if 6520 F breaks... deep support 6400-6200. 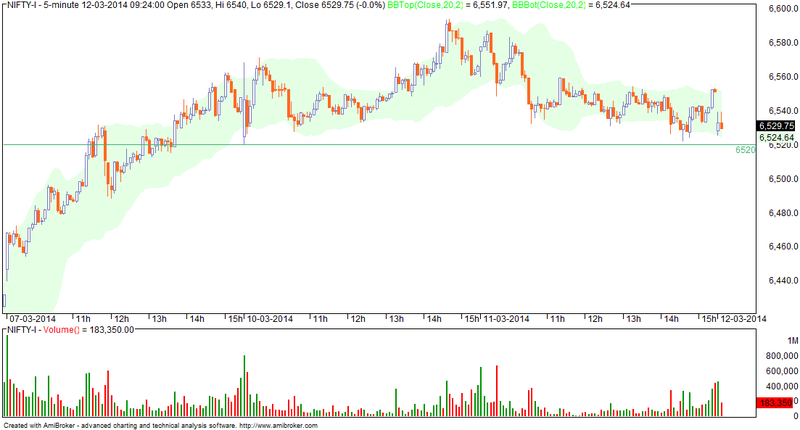 Resistance 6560 F.
6520 F still holding.... one hour more to go... let's see. Today was a difficult day as the trading range was relatively small. GOLD has been in uptrend from USD 1240 levels. Of late, the rally is stalling and this is accompanied by negative divergence on RSI. Important levels to watch are USD 1320 - 1360. If GOLD closes below 1320, it will mean exit of long position. Breakout above USD 1360 will imply further upsides with SL at 1320. Broader trend is up but the strong rally is expected to fizzle out shortly followed by a correction. Advance decline was flat even as VIX jumped by 6%. Initial bias was neutral with support formed at 6520 F and resistance at 6570 F (first 5 min bar). 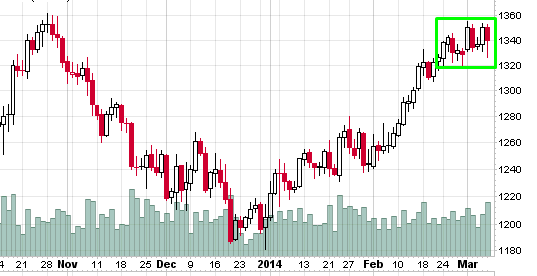 Copper trend down... resistance 445-455. Next support 430. Initial bias was bullish. Crossover above initial range (formed by 10am) gave first buy signal. NIFTY gains 2% today and 4.5% on weekly basis. A highest closing was also achieved (lifetime high/ 52 week high etc). Advance decline was flat (not a good sign) so while the nifty rallied, other stocks sold off. Infact, highest gains were in banks and nifty stocks while midcaps were practically flat. First bar was a sell on open but this was a relatively small. There was no follow through selling and markets traded in a small range for 3 hours between 6360-6380F. NIFTY closes at lifetime high but marginally below the 52 week high of 6415 spot. Market trend up... will reverse on close below 6200 spot. First bar of the day pointed to a selling on gapup. There was a short trade (first arrow) which was avoidable in the sense that broader trend was up and an anti-trend was likely to fail. Markets close above recent swing high (minor one). While I was expecting a retest of 6100, this was not to be. I have not shown first bar of the day as it had a low of 5620F and including this would have distorted the chart substantially. Possible formation of a top or swing high... this implies resistance at 6300 levels and a possible correction to 6100 levels. So not much of a deep correction. NIFTY opened in previous day's range (6265 - 6295 F). A short opportunity developed in the boxed region as nifty traded in a small range for a very long time and also formed candlesticks with upper tails. It was also very clear that short positions were getting built up at any intraday bounce at these levels. 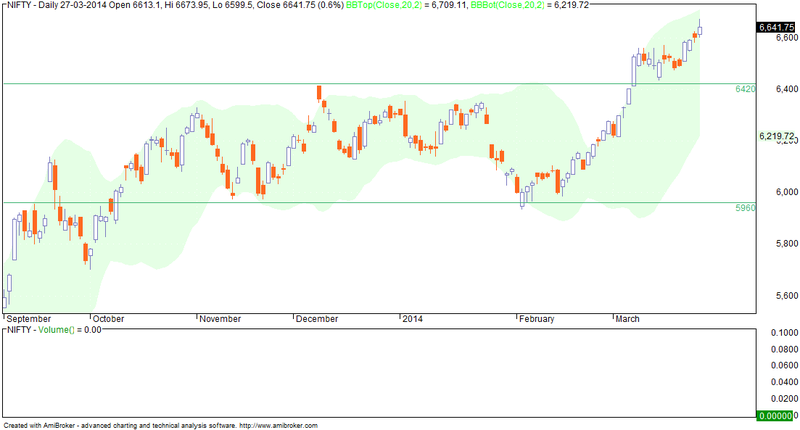 On daily charts, nifty is nearing previous resistance levels though some more upmove cannot be ruled out. Possible sell signal but after the recent breakout it might that this will only lead to formation of a higher swing low. Trend is up but we have signs of minor selling pressure creeping in at current levels. Support at 1310-1320 levels. Resistance 1360.